The finest known Australian 1855 Sydney Mint gold Sovereign, made during the first year of that mint’s operations, was discovered during the last expedition to the fabled “Ship of Gold,” the SS Central America, that sank while sailing to New York City in 1857. Now graded PCGS MS62+, it is one of 82 sunken treasure world gold coins representing 10 different countries retrieved in 2014, recently cataloged by the California Gold Marketing Group and now certified by Professional Coin Grading Service. 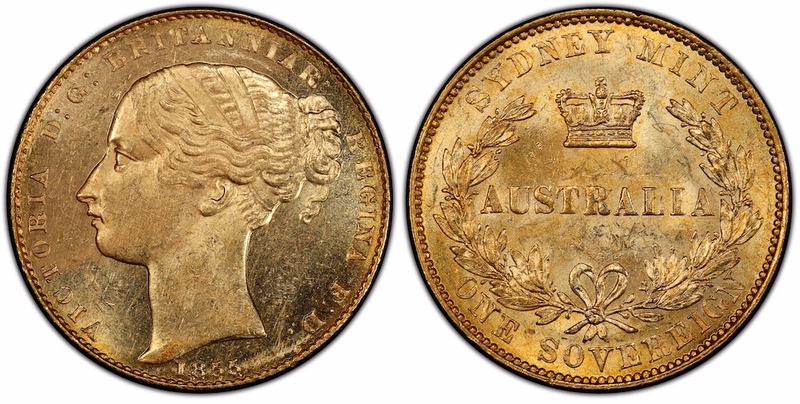 “The 1855 Sydney Sovereign is the equivalent of the U.S. 1854-S Half Eagle; both ‘S’ mints, both first year of striking. It’s an amazing discovery,” stated Dwight Manley, managing partner of the California Gold Marketing Group. He compared the rarity and historical significance of the recovered Australian coin to one of only four known surviving 1854 $5 denomination gold coins made during the San Francisco Mint’s first year. The finest known 1855 Sydney Mint Australian Sovereign, now graded PCGS MS62+, was discovered recently among the coins recovered in 2014 from the SS Central America. “An 1856 Sydney Mint Sovereign, now graded PCGS AU58 and even rarer than the 1855, also was found. Someone apparently traveled from Australia to the San Francisco area with the 1855 and 1856 gold coins,” Manley revealed. “It is fascinating to think about how these coins got to San Francisco. Were they carried by an Aussie miner seeking his fortune during the California Gold Rush or acquired as winnings in a gold camp poker game? Those two coins were onboard when the SS Central America went down 161 years ago,” said Manley. “The two Australian coins were found in the same area of the seabed more than 7,000 feet below the surface of the Atlantic Ocean off the coast of the Carolinas,” explained Bob Evans. He was the chief scientist on the 1980’s missions that first located and recovered a portion of the fabulous SS Central America treasure and then assisted with the 2014 recovery. “Communication, commerce, and travel between California and Australia were fully developed during the 1850s, in spite of the 7,500-mile steamship voyage required. The Australian Gold Rush that started in 1851 attracted a diverse, multi-national throng, quickly changing the demographics of the former penal colony. Many among the international crowd of gold-seekers visited both Australia and California seeking their fortunes,” explained Evans. The vast majority of the more than 3,000 gold coins recovered in 2014 were struck in the United States. But the retrieved world gold coins represent an interesting mix of Latin American and European coinage in addition to the two Australian gold pieces. Here are the countries and the number of recovered coins from each: Australia (2 coins); Bolivia (1); Federal Republic of Central America (1); Costa Rica (3); France (20); Great Britain (41); Mexico (5 including 3 contemporary counterfeits), Netherlands (6); Peru (2); and Spain (1). 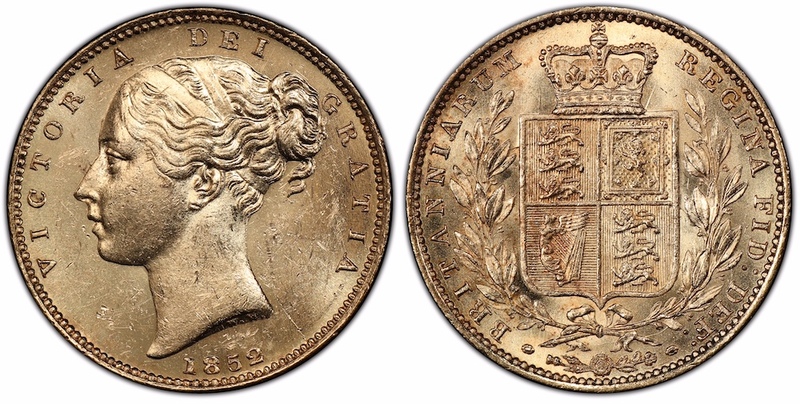 Among the other notable world coins recovered in 2014 and now cataloged are: Great Britain 1852 Queen Victoria Sovereign with Arabic 1, PCGS MS63+; Great Britain 1855 Queen Victoria Sovereign, PCGS MS62; and two Great Britain 1856 Queen Victoria Sovereigns, one graded PCGS MS62, the other PCGS MS61. Among the 82 world gold coins recently cataloged from the 2014 recovery of sunken treasure from the SS Central America was this Great Britain 1852 Queen Victoria Sovereign with Arabic 1, now graded PCGS MS63+. Also now certified are Costa Rica 1855 JB 1/2 Escudo, PCGS MS63; France 1854-A Napoleon III 5 Francs, PCGS MS61 and France 1855-A Napoleon III 20 Francs, PCGS MS61; Mexico 1852-Go 8 Escudos, PCGS MS61; Netherlands 1840 (u) King Willem I 10 Gulden, PCGS MS63+; and Spain King Ferdinand VII 1809-S Draped Bust 2 Escudos, PCGS AU50, the oldest-dated gold piece recovered from the famous ship. “It’s kismet that one of the recovered coins from the SS Central America, an 1835 2 Escudos, was from the Central America Republic,” said Manley. The Federal Republic of Central America was a sovereign state between 1823 and 1841 comprising at times part of what is now Costa Rica, El Salvador, Guatemala, Honduras, southern Mexico and Nicaragua. Each of the PCGS-certified world coins now is encapsulated in specially-produced and labeled holders that contain a pinch of recovered SS Central America gold dust in a separate compartment. The insert label includes a statement of authenticity hand-signed by Evans.